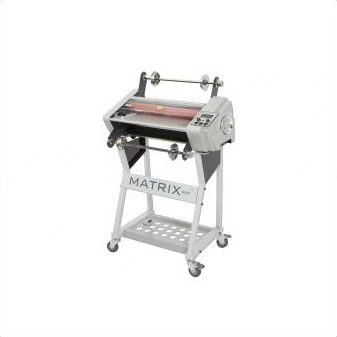 We stock the excellent professional range of Matrix Laminating systems. These single single laminators are ideal for busy finishing house’s as they keep turnaround times to a minimum and ensure all jobs are kept in house. Complete with semi automatic feed and built in seperator system, the Matrix laminators mean prints come off ready for the guillotine. 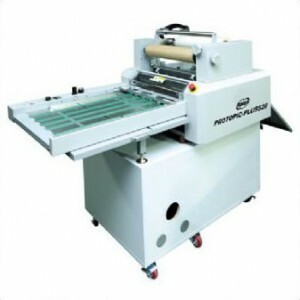 Contact us to find out which laminating machine is best for your company. 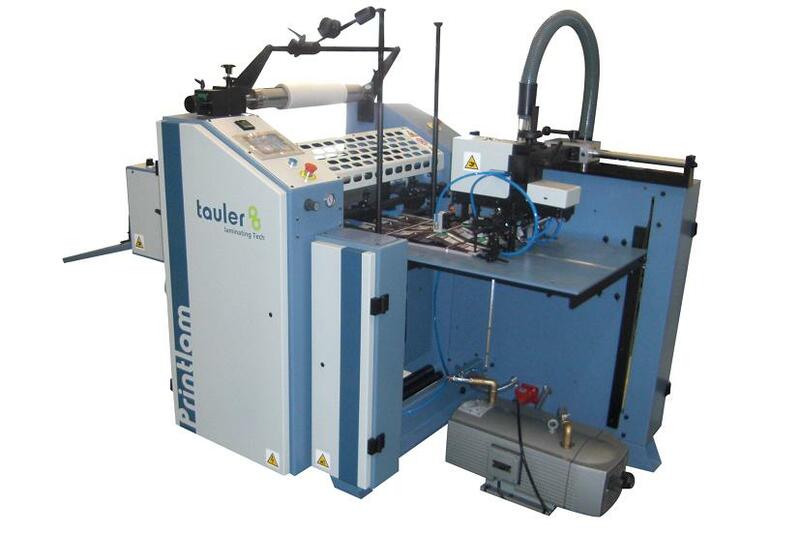 The Tauler Printlam CTI/CTIS B1 laminator range, available in 750mm or 1050mm working width and offers the the ability to do the largest formats in the Tauler range. The Printlam CTI is fully automatic including an automatic sheet feed via pneumatic feeder head. 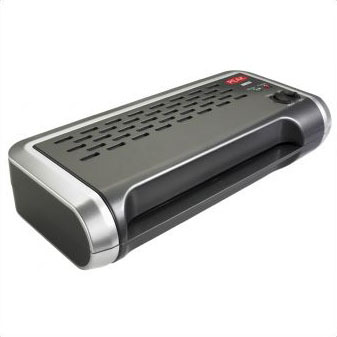 This heavy duty laminator has been constructed to be durable and hard wearing, using high quality steel and top electrical components. This machine is available in 2 versions. The CTI 75 (750mm) and the CTI 105 (1050mm). Also available in the range is the CTIS model which is complete with a deep pile delivery, adding the option of stacking on to pallets. 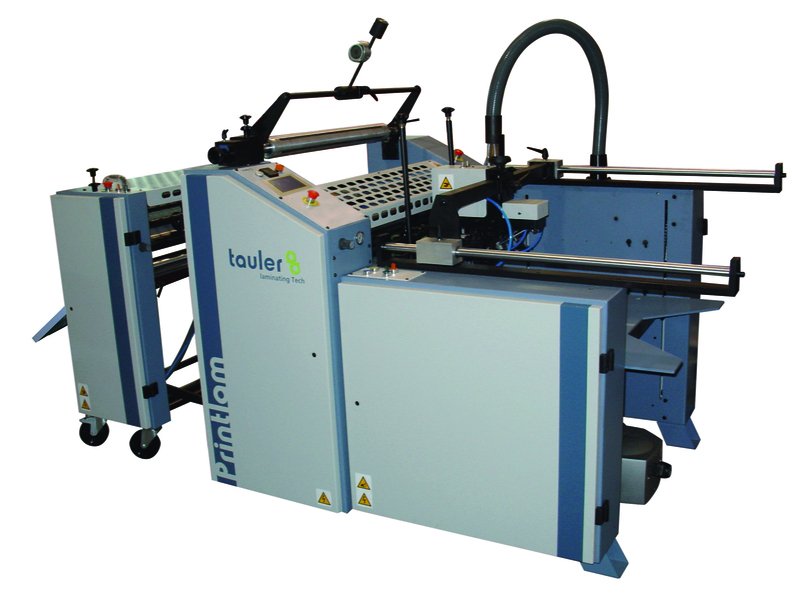 Introducing the Tauler Printlam B2 professional laminator, a fully automatic machine for high volume and long run work. With the automatic feed and stack height of up to 530mm it is well suited for 1 operator to load up long runs. Pneumatic pressure roller system ensures quality throughout the lamination process, offering the best results of any similar machine on the market. Ideal for digital and offset printing. 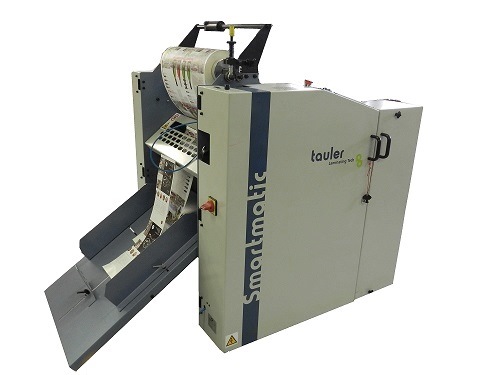 The Tauler SMARTMATIC Laminator is a fully automatic, high speed pneumatic machine that is guaranteed to increase productivity and offer the unparalleled results for a machine of this size. A top quality finish is achieved by the pneumatic pressure roller system that applies more pressure to the film on the stock, ensuring a firmer, neater finish and less risk of the film being lifted off the sheet. The roller sciossor system means sheets don’t have to be skewed when exiting the machine, this also means thinner stock can be fed though without the danger of it creasing on exit. User friendly with its fast set up times means operators are able to save time and increase production rates. The automatic feed has a stack height of 480mm. Pneumatic pressure roller system. Extra pressure for finer, more professional finish. High Speed. The SMART 52 is the quickest machine on the market for its size. Mechanical speed of up to 20m/min is available. Oil filled cylinder to maintain a steady and even heat throughout operation. 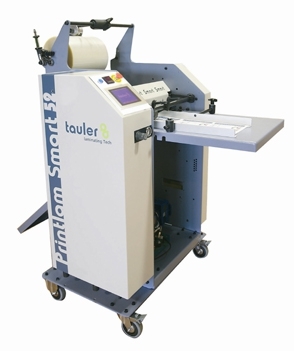 The Tauler Printlam SMART 52 Laminator is a compact, semi automatic machine with pneumatic pressure roller system that ensures the best and most professional finish to all your laminated documents. Ideal for digital and offset printing. The pneumatic pressure roller system allows for standard film to be used more often instead of specially designed, more expensive digital film. The roller system also reduces the chances of the film lifting off the paper. The maximum format it will laminate is 520mm x 720mm. The Tauler SMART 52 laminator has several features that you will not see on comparable rivals. Highest speed on the market with up to 15m/min. It is equipped with a sealed, oil filled cylinder to maintain a steady heat, opposed to other brands that have electrical elements that fluctuate while on. High Speed. The SMART 52 is the quickest machine on the market for its size. Mechanical speed of up to 15m/min is available. 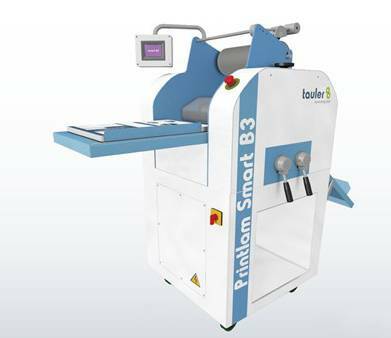 Binding Store is pleased to bring to you the Tauler Printlam SMART B3 Laminator, the entry level machine in the Tauler range of laminating equipment. The SMART B3 is an ideal solution for printers looking to upgrade to a more professional machine or enter in to the finishing side of production. With the built in scissor roller this machine differentiates itself from its direct rivals and makes the exit process smoother and trouble free. 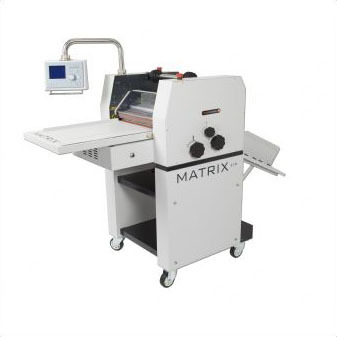 The Matrix 530 Single Sided Laminator now has the option to have an automatic feeder. It works on a suction fed system and uses a seperate compressed air unit. 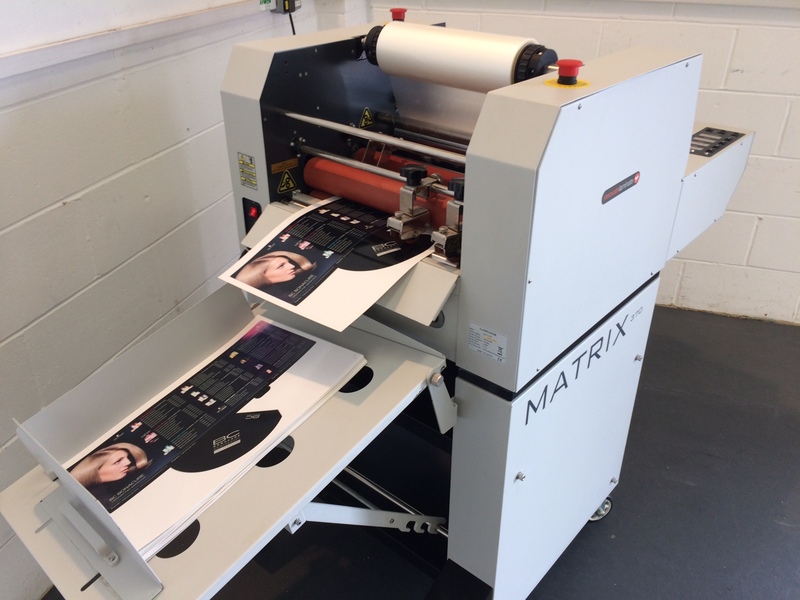 This auto feeder allows staff to leave the Matrix 530 and get on with other print jobs, increasing productivity. The protopic plus is a professional laminator for single-sided lamination up to 520mm width. Very popular with digital printers and print-on-demand situations. Adjustable decurling bar to get flat laminates. Embossing rollers are available for the Protopic Plus-520 in sparkler, linen, fine texture and leather making this laminating machine stand out from others. The Peak neat has been designed to be compact, lightweight and easy to operate. Each model features 2 heat settings for 75 (150 total) and 125 (250 total) micron pouches, reducing the risk of user error. The Matrix 530 Single Sided Laminator is the best value single sided laminator on the market and is designed for short to medium size runs. The ability to bring high performance lamination in-house means you can avoid costly set up charges from outsourcing and ensure perfect results everytime. The Matrix 530 laminating machine is an ideal investment if you produce brochures, folders and business cards that need laminating in a gloss or matt finish. Go beyond digital printing and experiance the power of profitable laminating. Automated in-house single sided laminating is finally affordable. Beat your competition and offer a faster, cheaper lamination service. Keep control of your print jobs and increase turnaround with the Matrix MX-530 laminator. The Matrix 370 is a totally new single sided laminator with a built in separator system designed for up to SRA3 size prints. Maximise performance and profitability by investing in a system that has a quick set up time and high speed performance. The Matrix-370 is equipped with a semi-automatic feeder and a fully automatic separator – work comes off finished sheets ready for the next process. Suitable for traditional offset and digital sheets giving you maximium flexibility. Side lays ensure prints are fed perfectly. An auto sheet register and overlap system via front guards allows for one operator to perform non stop laminating. A superb investment for all printers. With no set-up charges you can keep your lamination work in-house and truly laminate on demand. Sheets can be laminated up to an impressive 10 metres per minute. 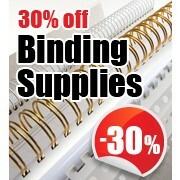 Call Binding store now to arrange a demonstration and for our best price on this product. Perfect for those businesses that want to print on demand but are currently restricted by the need to outsource their lamination. Ideal for short to medium size runs there is no need to pay costly set up charges, and no delay! Solidly constructed and great for a wide range of applications the Matrix Duo is the best value single sided laminator on the market. 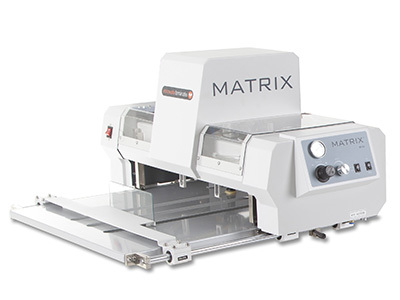 The Matrix Duo-650 allows the flexibility of single side lamination and encapsulation providing an affordable and effective solution. The unique anti-curl bar allows even the thinnest of laminates to be applied without the worry of a curled finish and extension arms allow large rolls of film (up to 1000m) to be used saving changeovertime. The Matrix Duo’s are built for continuous use on an everyday basis and have been constructed using parts of the highest quality including heavy duty motors and all metal construction. A new addition to the Matrix Duo-650 is an optional perforator to allow for easy seperation of laminated prints. The Matrix Duo 460 Laminator is perfect for those businesses that want to print on demand but are currently restricted by the need to outsource their lamination. Ideal for short to medium size runs there is no need to pay costly set up charges, and no delay! 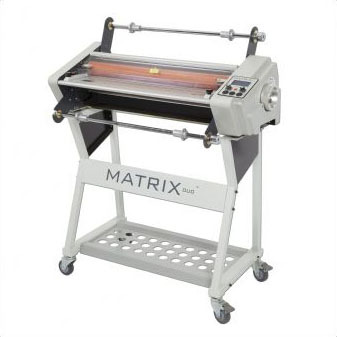 Solidly constructed and great for a wide range of applications the Matrix Duo is the best value single sided laminator on the market. The Matrix Duo allows the flexibility of single side lamination and encapsulation providing an affordable and effective solution. The unique anti-curl bar on both models allows even the thinnest of laminates to be applied without the worry of a curled finish and extension arms allow large rolls of film (up to 1000m) to be used saving changeovertime. Matrix Duo’s are built for continuous use on an everyday basis and have been constructed using parts of the highest quality including heavy duty motors and all metal construction. A new addition to the Matrix Duo-460 is an optional perforator to allow for easy seperation of laminated prints.